The following recipe from Chef Andrew Gerson appeared in our January 2016 issue. This refreshing seafood crudo pairs well with the fruity and vibrant notes of many Southern Hemisphere hops. The flavor and aroma compounds found in many of the hop varietals of New Zealand and Australia are citrus-forward with underlying tropical fruit notes. 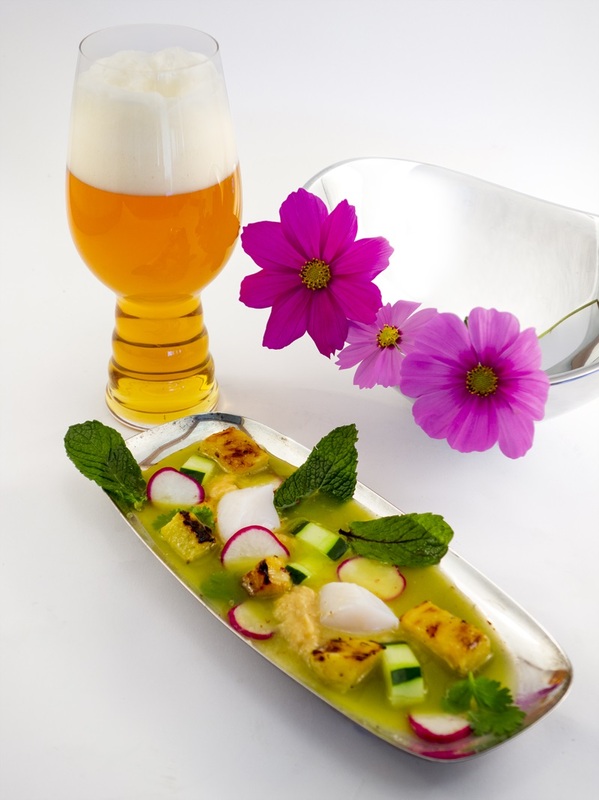 The juice from pineapple, lime, cucumber and fragrant herbs accent hop character. The charred pineapple and savory emulsion create sweet and tangy caramel notes that accentuate malt profiles and offset any perceived hop bitterness. Crunch and a bit of heat are added from the cayenne lime-compressed cucumber, welcomed by the predominant characteristics of these hop varietals. The scallop is served raw. Serves four as an appetizer. 1. Make the charred pineapple: Preheat oven to 500 F. Peel pineapple and cut into ¾-inch slices. Toss with salt and olive oil and lay on a baking sheet. Broil until sugars begin to brown and caramelize. Let the pineapple cool and slice into cubes. 2. Make the herb juice: Place the ingredients in a blender and blend until smooth then strain through a fine strainer. Season with salt to taste. 3. Make the cayenne lime marinated cucumber: Mix the lime juice with the cayenne, salt and honey. Cut the cucumber in small wedges and submerge in the liquid. 4. Make the pineapple emulsion: Sauté the onion in the butter until translucent. Add the pineapple, salt and cayenne. Cook until tender and juices are released (7-10 minutes). Place ingredients in a blender and blend until smooth. To assemble: Take four small bowls and place a dollop of the pineapple emulsion on the bottom of each. Quarter each raw scallop and divide among four bowls. Strain the cucumber and place around the scallop. Scatter cubes of pineapple around the bowl. Pour an ounce of herb juice in the bottom of the bowl. Garnish with a few rounds of radish, the reserved herbs and finish with a pinch of salt and smoked paprika.